"Over the last several years, I've become convinced that being stuck in the middle scale-wise is incredibly challenging. While I've written about this struggle numerous times, I've never written as concisely or as eloquently as Mr. Parry. "You are," he says, "somewhere between a real business and a self employed Mom and Pop operation. There is never enough money or enough time." By contrast, small operations subsidize their living expenses with off-farm jobs. "You believe in the benefit of what you are doing," he writes. "Because of your belief system, it is worth it.... You have little time and money to spare, but you persevere." Parry talks about reassessing his farm's assets - his "unfair advantage." In his case, his family decided that it was the fact that they owned "1100 acres of verdant green irrigated pastures that [are] one of a kind in our dry southwest climate." While their livestock operation is going back to a commercial (as opposed to direct-market) approach, the Parry's are "selling the view" - developing agricultural tourism enterprises to compliment commercial sheep and cattle production. Given our own struggles to come to terms with the challenges of scale, I can imagine that Mr. Parry and his family also resisted the decision to shut down the direct marketing part of their operation. However, his article ends on a positive note. "Fox Fire Farms still has all the livestock.... What has changed is that it is back to low cost, commercial production." Partly because of our ongoing drought, we're headed in the same direction this year - we don't anticipate direct marketing any meat from this year's lamb crop. Parry concludes, "A correctly structured commercial livestock enterprise has a lot going for it, not the least of which is time for life's other priorities." I find this statement especially encouraging as I head out to check sheep before driving to town to watch my oldest daughter's varsity soccer match. In some ways, the changes at Flying Mule Farm have been forced on us - by the dry winter and by the economic realities of mid-scale livestock production. These last several years have been stressful, as regular readers of this blog will no doubt acknowledge. Mr. Parry's article has helped me realize that we haven't been alone in this struggle. His ability to make positive changes to his operation that allow him and his family to make "time for life's other priorities" is incredibly reassuring and liberating. Over the coming weeks, I plan to share some of our thought processes regarding our own "unfair" advantages and what they mean for the future of our business. I hope my handful of readers will weigh in with their own insights and experiences! Thanks to Richard Parry for stating the obvious: "Everyone does not have to be a direct marketer of meats." Back on November 21, 2013, we measured 1. 53 inches of rain at our home place near Auburn. While this wasn't the first storm of the fall, it did represent our germinating rain – that is, it was enough precipitation to get our annual grass and forb plants to germinate. Just 16 days later, we received another half-inch of precipitation in the form of snow. Following this brief storm, our weather turned cold – our morning low temperatures dipped below 20 degrees F for several days, and our high temperatures hovered in the high 30s and low 40s. The combination of cold weather (which dropped soil temperatures below 50 degrees F) and short day lengths put our newly sprouted forage into dormancy – ending our fall growing season. Little did we know that the snow we received on December 6-7 was the last precipitation we'd measure until January 29, 2014. The grass that grew between November 21 and December 7 was all the green forage we'd get until mid-February. Last week, I received an update from the Sierra Foothill Research and Extension Center (SFREC) in Browns Valley, California, regarding estimated forage (grass) production. As you may recall, the January 1 measurement at SFREC was just 52 pounds per acre of forage – about 10 percent of normal for that date. The big storm we experienced in early February (over 7 inches of rain in four days) helped tremendously, as did the smaller storms that came through in late February. 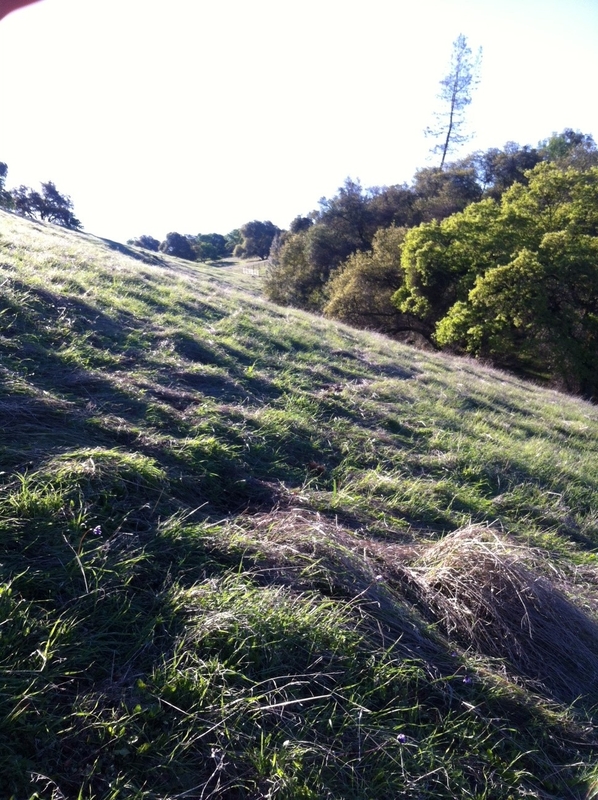 As of March 3, SFREC measured 400 pounds of forage per acre (about 58 percent of normal). Based on data collected at SFREC since 1979-80, we now have as much forage as we would expect to see by December 1 in a normal winter – in other words, we are 3 months behind schedule when it comes to growing grass. My experience with grazing our sheep near Hidden Falls Regional Park northwest of Auburn confirms this lack of production. Our ewes are currently giving birth – which means they are consuming nearly twice as much forage as they do when they are not pregnant or producing milk for lambs. We typically time our lambing season to coincide with the onset of rapid grass growth – we try to match our period of highest demand with the supply of highly nutritious and rapidly growing forage. 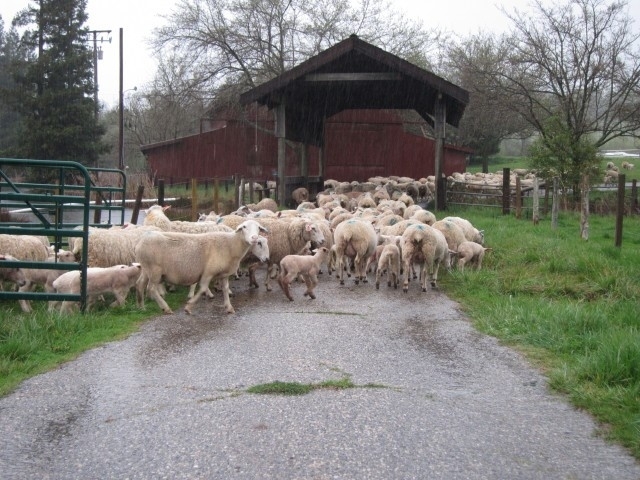 Last fall when we turned our rams in with the ewes (ewes are pregnant for about 150 days), we expected normal weather and forage production. This spring, we're adjusting to much drier conditions. Since we currently have about as much green grass as we'd expect to see in December, this means that we're moving sheep much more frequently. Yesterday, I built a 3+ acre paddock using portable electric fencing. Normally, this much grass would last our ewes 3-4 days at this time of year. 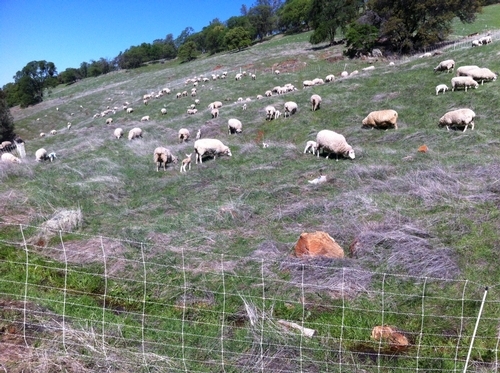 This year, we were able to keep the sheep in this paddock for about 36 hours. 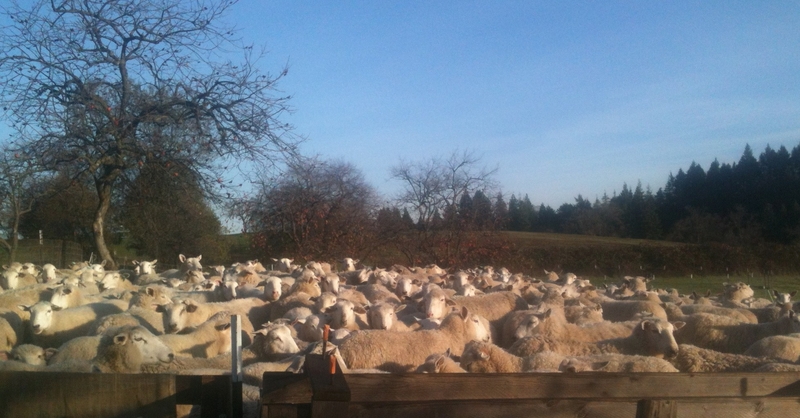 The drought means we are spending twice as much time moving sheep as we normally would in March. It also means that our pasture recovery periods (the time in which we let graze pastures rest before grazing again) are longer - 35-40 days rather than the 25-30 days we'd normally expect in mid-March. Because of the short grass this spring, I'm growing increasingly worried about conditions next autumn. Our foothill rangelands are dominated by annual grass and forb (broadleaf) species. By definition, an annual plant must complete its lifecycle in one year – that is, it must germinate, grow, reproduce and die all within one growing season. In drier years, annual plants will often mature and reproduce earlier – and at a lower height – in order to ensure that they create seeds for the next growing season. I anticipate that we'll see our rangeland plants mature earlier this year – I'm already seeing foxtail barley and wild oats “heading out” (setting seeds) in early March – a good month earlier than normal. It provides a micro-environment that encourages earlier germination once the fall rains commence by moderating temperature, retaining moisture and protecting new grass seedlings. It protects our soils by providing root structure and intercepting the energy of falling rain drops - in other words, it prevents erosion. It helps give more desirable plants a leg up on invasive weeds (generally). Invasive weeds tend to like disturbed or bare soils. Too much residual can also encourage invasives to take over a site, so we try to find a balance. Finally, saving this much dry grass gives us a stockpile of dry forage going into the fall months. Dry grasses are not terribly nutritious for our livestock (we generally need to provide some supplemental nutrition), but we time our production system to be able to graze our ewes on this dry feed when they have lower nutritional demands (that is, when they are not about to give birth or lactating). Based on past experience, we may be lucky to grow 800-1000 pounds of grass on some of our rangelands this year, so taking half would leave us under this threshold going into next fall. If we graze too much this spring, we create the potential for erosion and weed infestation next year - and we'd have little or no fall feed for our ewes. Many beef cattle producers in the foothills breed their cattle to deliver calves in the fall. This may seem counter-intuitive based on the above discussion (after all, these cows experience their greatest nutritional demand at a time when the quality of forage is at its low point for the year). However, many ranchers feel that they can take better advantage of the spring flush of forage growth if their calves are mature enough to gain weight from grazed forage. Fall calving operations have limited options for dealing with shortages of fall forage – they can purchase hay, lease additional grazing land, and/or sell cows. As a sheep producer, I have more flexibility. This winter and spring we're grazing on land that has not been grazed for two years, which allows us to save our summer and fall grazing land. While we may graze the land we're currently grazing again next winter and spring, we're not relying on it for forage this coming fall. Consequently, we can make sure we leave enough residual dry matter to provide the benefits outlined above. We'll also continue to look for options to graze additional rangeland through the summer and fall months. Because our entire system (animals, fencing, livestock water, etc.) is portable we can move our animals to where the feed is (rather than buying additional feed and bringing it to the animals). On Monday, March 24, UCCE Livestock and Natural Resources Advisor Roger Ingram is organizing a workshop in Auburn for livestock producers to help us work through these questions on our own operations. We'll get some hands-on experience in estimating forage supply and thinking through our fall forage scenario. Roger will also provide information regarding animal health and nutrition, and early weaning strategies. 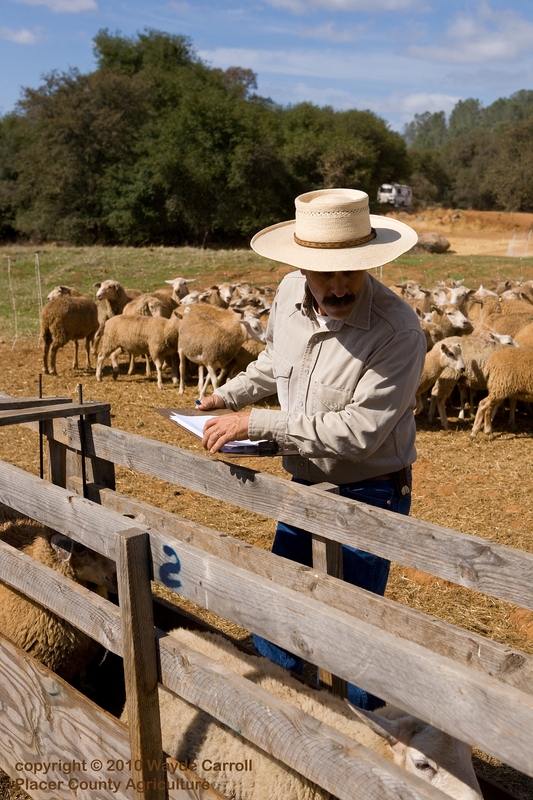 For more information, go to http://ucanr.edu/sites/placernevadasmallfarms/?calitem=234305&g=22527. Drought planning, as I've written previously, is most effective if it's done while it's raining! 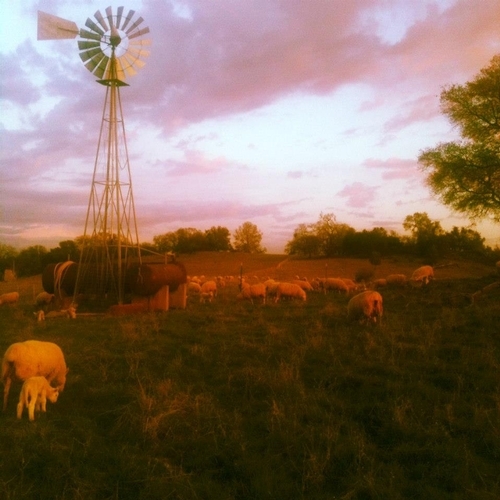 While we've chosen to raise sheep for a number of reasons, the flexibility that sheep (and other small ruminants, like goats) provide for harvesting forage seems like a good decision during the current drought. We'll see what next fall brings us! Over the years, I've come to realize that one of the principles of working or moving livestock is that I must move slowly to go fast. Every time I get in a hurry to get something done - loading sheep in the trailer or moving sheep through the corrals, for example - the job takes much longer than it would if I had the proper patience. The animals seem to sense my frantic energy, which makes them frantic, as well. Early on in my sheep ranching adventure, I was drawn to the stockmanship principles developed by Bud Williams. Bud once said that his system was focused on letting the animal do what he wanted them to do. When I'm quiet, my dogs are quiet as well - and the job goes quickly. I let the animals do what I want them to do! Several weeks ago, we moved the entire flock onto new pasture. A handful of 2-3 day-old lambs decided it would be great fun to stay back in the old pasture. Rather than try to catch them or chase them, I worked with Mo to quietly and slowly herd them ahead to the rest of the flock. Mo was incredibly patient - herding young lambs is worse than herding cats - and I tried to quietly help Mo follow his instincts. We finally got the lambs close enough to the new paddock that their mothers found them and led them the rest of the way. Late one afternoon, I came upon a lamb that didn't seem to have a mother. She was dried off and energetic, but her mother was nowhere to be found. I tried putting her with a ewe that had another lamb, thinking that perhaps she was a twin. The ewe ultimately rejected her, but I decided to leave her in the pasture until I came back for my evening rounds. She was still by herself when I returned, but I tried putting her with another ewe that had a single lamb. Bingo! The lamb was her missing twin, and when I left tonight both lambs were following her and nursing regularly. Yesterday, we moved all 190+ ewes and their lambs (well over 400 animals in total) about three quarters of a mile through three gates and onto fresh pasture. Without lambs, two dogs and one shepherd could accomplish this task in about 15 minutes. With lambs, it took us more than an hour – and the dogs and I even had two extra human helpers! When moving pairs (ewes with lambs), I’ve learned to go slowly and let the ewes double back to find their lambs. Had we tried to haul the animals rather than walk them, it would have taken all day (and been much more stressful on everyone). Much of my time at lambing is spent waiting and watching - waiting for a ewe to deliver her lambs on her own or watching to make sure that a ewe has bonded with her lambs. If I move to quickly at this point, I risk disrupting the ewe-lamb bond by pulling a lamb or increasing my labor requirements by bringing a lamb home to be bottle raised. I’ve developed little ways to trick myself into waiting – if I come upon a ewe in labor, for example, I’ll force myself to go build fence before intervening. Going slow, in this case, means less work! In his book Outliers: The Story of Success, Malcom Gladwell writes that, “To become a chess grandmaster also seems to take about ten years. (Only the legendary Bobby Fisher got to that elite level in less than that amount of time: it took him nine years.) And what’s ten years? Well, it’s roughly how long it takes to put in ten thousand hours of hard practice. Ten thousand hours is the magic number of greatness.” While Gladwell is discussing outliers – those individuals in specific professions that stand head-and-shoulders above their peers, I think the “10,000 Hour” rule applies to many activities, including – in my case – sheep farming. I don’t claim to be an expert shepherd – I’m often humbled by the realization of how much I don’t know about raising sheep. However, I estimate that since I started raising sheep on a commercial scale in 2006, I’ve spent in the neighborhood of 14,000 hours doing everything from moving portable electric fence to trimming hooves to analyzing the economics of my business. And while I still have more questions than answers about how to make my living by raising sheep, there are parts of this business that are far easier now that I’ve invested so much time! Some of the benefit is akin to muscle memory. If you repeat a physical motion enough times – like playing the piano – eventually your muscles remember where to place your limbs and digits. These movements become second nature. 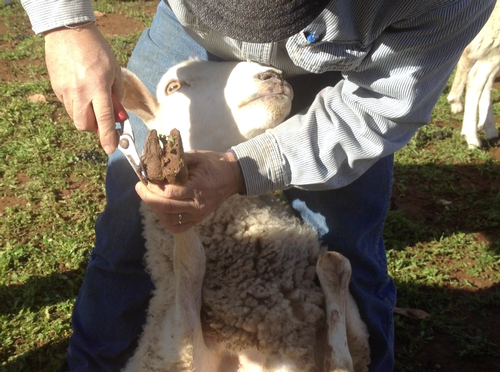 Last week, we completed our annual task of trimming feet, a process that involves tipping every ewe onto her backside and trimming all four of her hooves. With 250 +/- sheep, this meant trimming approximately 1,000 feet! 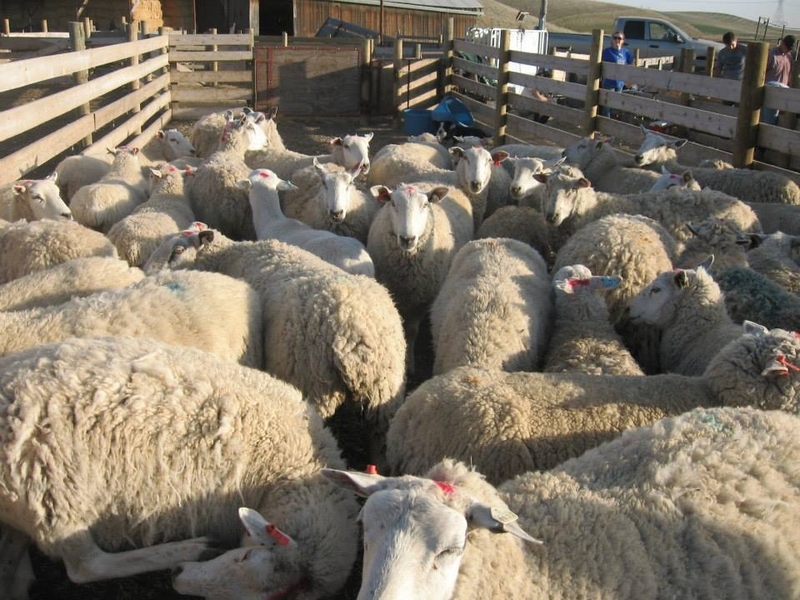 Just 5 years ago, such a task would have left my back sore for several days – and it would have taken three people just to treat our flock of 100 ewes in a single day. Last week, with help from a few friends, we treated 250 animals in about 8 hours. Building electro-net fencing is another example of increasing efficiency. I estimate that I put up and take down my 164-foot rolls of electro-net between 700 and 800 times in a year. When I started learning how to use the fencing 7 years ago, a 6-net paddock (which encloses about 1.25 acres) took me several hours. Two weeks ago, I built a 16-net paddock (enclosing 9.25 acres) in less than three hours. Once again, I’ve now built enough fence that I learned how to be as efficient as possible. Some of the benefit of putting in the hours comes from learning from experience and knowing what to expect in certain situations. When we first started using livestock guardian dogs to protect our sheep from predators, I was always extremely worried when a dog got out of my pastures. Typically, I’d drop everything else I was doing and try to catch the dog. To my dogs, this became a great game – I could almost see them thinking, “let’s see how long he’ll follow me!” The dogs would eventually decide to come back on their own, but it took me several years to realize this fact. Last month, one of the dogs got out while I was sorting our rams from our ewes in a pasture. Rather than put the already-separated rams back with the ewes and track down the dog, I continued with my task. By the time I’d sorted the last ram from the flock, the dog had returned from his jaunt and was ready to be back with his sheep. I realize that this story doesn’t sound like much – after all, it only saved me 30 minutes of not chasing the dog all over the ranch. However, I find that each time I can apply my accumulated experience and knowledge I save myself (and my animals) time and stress – and these savings add up like compounding interest! Finally, spending time working on the business is as important as spending time working in the business. When I’m working “in” the business, I’m doing many of the things I’ve discussed above. When I’m working “on” the business, I’m thinking about bigger questions – how should I market my lambs next year, for example. I’ll admit I’d much rather spend the day working with my sheep than in front of my computer, but I find that the quality of my “on-the-business” work improves the more I do it as well. For instance, we’ve decided this year to keep our sheep year-round on properties much closer to home, which will reduce our overhead costs substantially. We’ve adjusted the scale of our operation to fit the land we can access without putting the sheep on a trailer. I suppose that this idea is at least indirectly related to scale. The more sheep you raise – or the more carrots you grow – the more quickly you cross the 10,000-hour threshold. Regardless of size, however, the investment of time in farming eventually pays dividends in skill level (and hopefully in profitability). The purpose of these stories is not to brag about my prowess as a shepherd but rather to illustrate that there is no substitute for putting in the time as farmers. While I believe strongly in the power of planning and analysis, at some point we all have to implement our plans – we have to farm! If we’re observant – and humble enough to learn from our mistakes – this investment of time will pay off. While 10,000 hours of working with sheep won’t make me as famous (or as wealthy) as Buster Posey (the Giants MVP catcher for you non-baseball fans) it will make me a better farmer!